May 15th - Awbury al Fresco: Celebrating the Spirit of Play"
As a community not-for-profit organization, partnerships with local organizations and businesses are a vital part of our mission and operations. 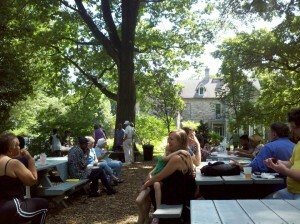 ❦ Chew and Belfield Neighbors Club Inc.
Did you know Philadelphia IS America’s Garden Capital? With more than 36 public gardens, arboreta, and historic landscapes all located within 30 miles, the Greater Philadelphia region has more gardens in close proximity than anywhere else on the continent! See all of the gardens that make this distinction possible at www.americasgardencapital.org.